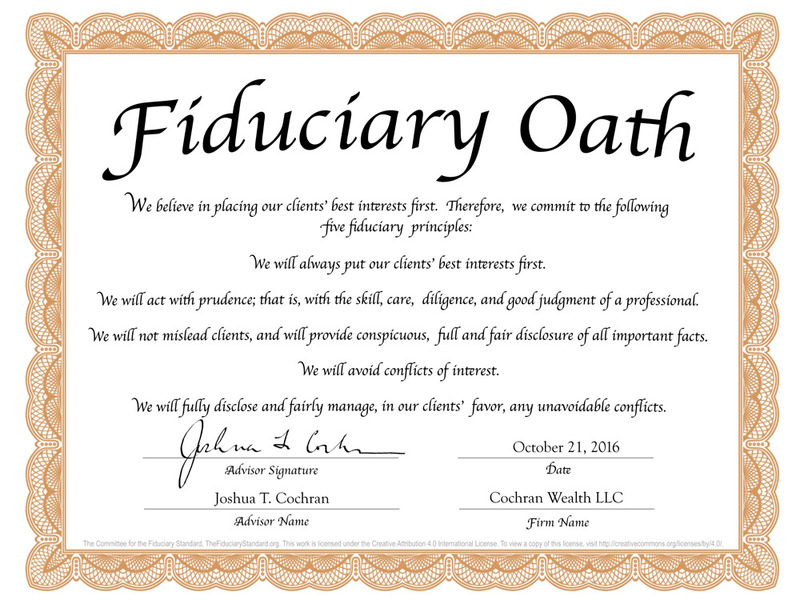 Cochran Wealth is part of a grassroots organization of financial service professionals known as the Committee for the Fiduciary Standard. The Committee’s goal is to educate legislators, regulators and the investing public about the importance of protecting investors by extending the fiduciary standard to cover everyone who provides personalized investment advice. If you are like most people, you assume that the people who provide investment advice are required to act in your best interest. Unfortunately, that’s only true for some advisors – those who are fiduciaries. Shouldn't my Financial Advisor be required to act in my best interest? Broker-dealers spend millions on lobbying so the law stays in their favor, not yours. The other set of rules are for firms like Cochran Wealth who are registered as investment advisers with the federal Securities and Exchange Commission (SEC) or comparable state regulators. Registered Investment Advisers are legally obligated to place your interests first, which is the reason we are called fiduciaries. This means we must not only be loyal to serving your exclusive best interests, but we must also adhere to a high standard of professional competence. As part of our commitment to the Committee for the Fiduciary Standard we have agreed to forward the attached “Fiduciary Oath” to all our clients. Please know that this oath is not just a “gimmick.” We take our fiduciary responsibilities and the subsequent protection of our clients very seriously. Thirty-four other financial advisors around the United States have joined Cochran Wealth in making this commitment.